Chicago opens its doors to public works professionals from all over the world next month during the American Public Works Association annual congress. Zeroing in on McCormick Place on the city’s near south side from Aug. 25–28 will be solid waste managers, sustainability specialists, city and county engineers, street/road/bridge superintendents, emergency management coordinators and thousands of other men and women whose responsibility is to keep America’s cities humming. At the Expo Experience, attendees can expect to find an almost-overwhelming assembly of service providers and product manufacturers prepared to demonstrate an easier, faster, less expensive or more efficient way of solving the day-to-day challenges that arise for city employees. Whether you’re upgrading a runway or planning to redesign a major intersection, experts will be present and ready to help on the expo floor and at the Technology Pavilion, Green Pavilion, Central Park products area and the Exhibitor Solutions Theaters. In classroom educational sessions taught by field-tested peers, the financial savings involved with use of trenchless technology won’t be the only useful information participants will leave with. Have you been reading about high-friction surfaces and wondering if they’d work on your steeper grades? Curious about how an iPhone/iPad application can make quick work of inventorying curb ramps for ADA compliance? APWA International Public Works Congress and Exposition 2013 is the place. 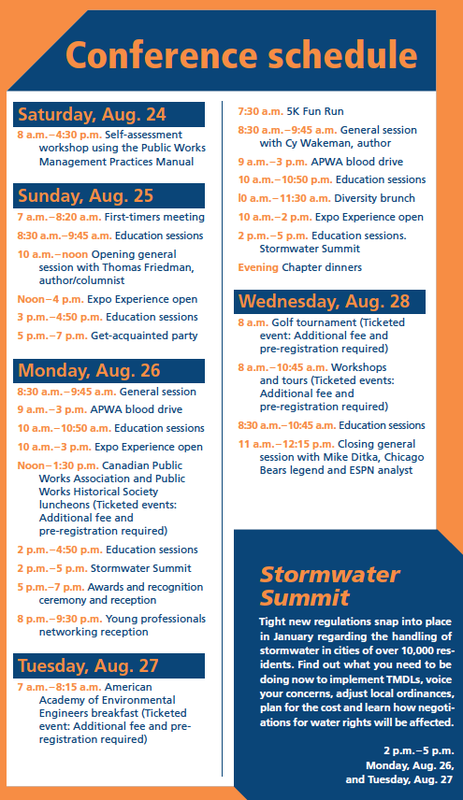 Registration is still open at www.apwa.net/congress. Come for the day or stay for the entire four-day experience. If hotel rooms at McCormick are full, don’t forget that there’s free shuttle service to McCormick Place from the Chicago Hilton and Palmer House hotels in the Loop.